The National Elections Authority (NEA) received a candidacy application from the head of the Ghad al-Thawra Party, Moussa Mostafa Moussa, on Monday, seven minutes before the NEA’s 2 pm application deadline. Moussa’s application is endorsed by 27 members of parliament, although the candidate declined to disclose to Mada Masr the names of the MPs backing his bid. Speaking to Mada Masr, Moussa clarified that all the MPs who endorsed him had not already endorsed sitting President Abdel Fattah al-Sisi’s bid for reelection. 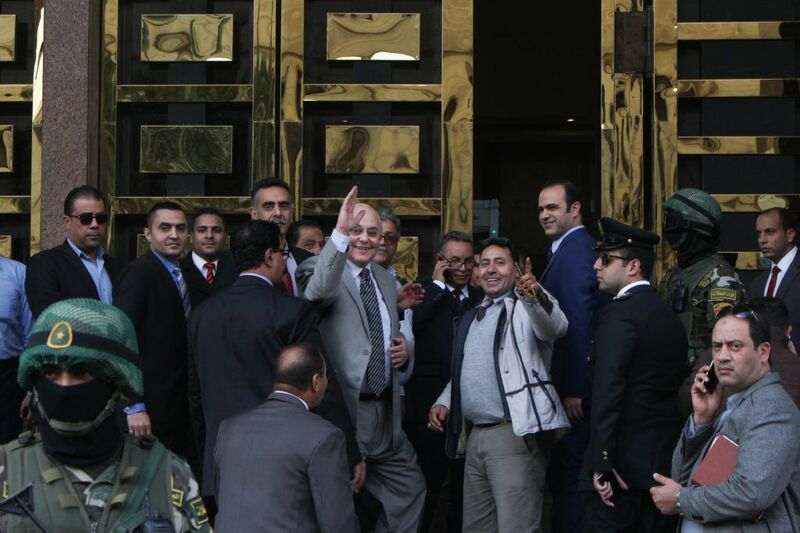 Although Monday’s parliamentary session was delayed for over five hours as the general secretariat processed the new candidate’s endorsement forms, all the MPs that Mada Masr spoke with would not identify who had endorsed Moussa’s bid for presidency. The party leader, who has thus far maintained a relatively low political profile, spoke to Mada Masr about his presidential program, noting that he intends to promote his vision across Egypt through campaign rallies and the Ghad al-Thawra Party’s governorate branches during the campaigning period mandated by the NEA, February 2 – March 23. NEA deputy director, Major General Refaat Qomsan, told Mada Masr that the NEA will announce on Wednesday the final list of presidential candidates, as well as the number of endorsements that each candidate amassed from citizens and/or MPs. According to the Constitution and the presidential elections law, in order for a candidate to be officially recognized by the NEA, they must first obtain 20 endorsements from MPs, or 25,000 endorsements from eligible voters across 15 governorates, with a minimum of 1,000 endorsements from each governorate. Journalists gathered outside the NEA’s headquarters in downtown Cairo on Monday to report on the final hours before the NEA’s candidacy application deadline, where citizens had also assembled to demonstrate their support for President Sisi. Mona Kamel, an employee at the Central Bank of Egypt (CBE) spoke to Mada Masr as she held a sign that read, “the people mandate Sisi to fight terrorism.” Kamel noted that she had already submitted her endorsement form for President Sisi’s reelection, but that she supports other candidates’ right to run in the upcoming elections. “We want 20 candidates, so that no one abroad says there are no elections or democracy,” she stated. Osama, an army officer who chose not to provide his last name, echoed Kamel’s sentiment, explaining that he came to the NEA on Monday to show his support for the president’s reelection campaign, and to urge the Egyptian people to participate in the upcoming electoral process. The NEA received Sisi’s candidacy application on January 24, delivered by his legal representative Mohamed Abu Shaqa. The statement was signed by a number of key political players, including: head of the Strong Egypt Party and former presidential candidate, Abdel Moneim Aboul Fotouh; former presidential candidate and MP, Mohamed Anwar al-Sadat; university professor and senior member of former presidential candidate Sami Anan’s suspended campaign, Hazem Hosni; former head of the Central Auditing Agency (CAA), Hesham Geneina; as well as former presidential advisor Essam Heggy. Several former presidential candidates have withdrawn their candidacy in recent weeks, rendering Moussa only the second candidate to submit his paperwork to the NEA, just minutes before the candidacy application deadline. Lawyer Khaled Ali announced his withdrawal from the presidential race, citing government violations that led to unfair competition. The campaign of former Armed Forces Chief of Staff Sami Anan announced its suspension after Anan was arrested and referred to military prosecution with accusations of violating military bylaws by running without acquiring the military’s prior approval. Anan is currently being detained in military prison, according to his lawyer Nasser Amin. Former MP Mohamed Anwar al-Sadat withdrew from the 2018 presidential elections earlier in January, stating that the general political climate could place his supporters and campaign members at risk. Sadat’s withdrawal came just a week after former Mubarak-era Prime Minister Ahmed Shafiq also withdrew from the 2018 race. Armed Forces Colonel Ahmed Konsowa was sentenced in December to six years in prison, charged with violating military bylaws, after he announced his intention to run for president while still an active member of the Armed Forces. This verdict was upheld by a military appeals court on Monday. Another potential candidate, the head of the Wafd Party, Al-Sayed al-Badawy, had reportedly begun the candidacy application process over the weekend, but the Wafd Party leadership ultimately decided not to field Badawy as their candidate, citing support for Sisi instead. The NEA has announced that the 2018 presidential elections will be held from March 16 – 18 for Egyptians abroad, and from March 26 – 28 inside Egypt.